So, why solar? Out of all of the available renewable energy options (including wind, biomass, ocean power, etc.) and, for that matter, conventional options (natural gas, oil, coal, nuclear) why is ReVision Energy in the business of solar and why should Northern New England implement solar as the solution to our energy insecurity? Traditional methods of energy generation through the use of fossil fuels are limited, as the resources—such as coal, uranium, and natural gas—are finite. On the other hand, sustainable energy resources—such as solar, wind, and geothermal are renewable. Of the many sustainable options, the amount of solar energy that the earth receives each year dwarfs all of the other resources. In fact, enough solar energy falls on the earth’s surface each minute to meet world energy demand for an entire year (DOE). OK, so – there is a lot of solar energy that hits the earth. But is there really enough available sunshine in New England for solar to offset my energy needs? 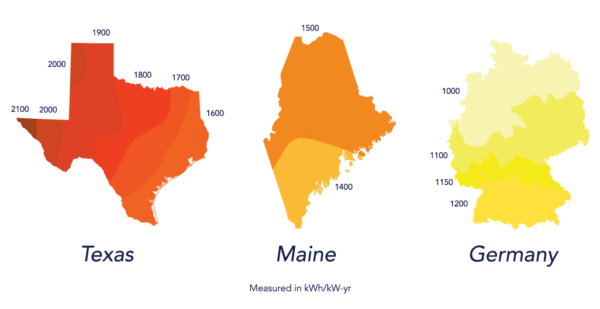 Maine, New Hampshire, and Massachusetts have very favorable solar energy resources (also called ‘solar insolation’). What we can learn from the chart is that Maine has a similar amount of solar insolation as Texas, a very sunny state and a 30% greater resource than Germany, a world leader in solar energy. Maine is on the same latitude as the French Riviera! Though Germany’s solar resource is on par with Alaska, they have a much higher level of solar adoption than New England thanks to making it a national priority and creating policies that drove market investment in solar energy. Ironically, it is Germany’s deep investments in solar that spurred the growth of the modern solar electricity as we know it, and resulted in the reduction of costs that has made solar more cost-effective globally (SEIA). At times during the year, Germany may be running as high as 95% on renewable energy! 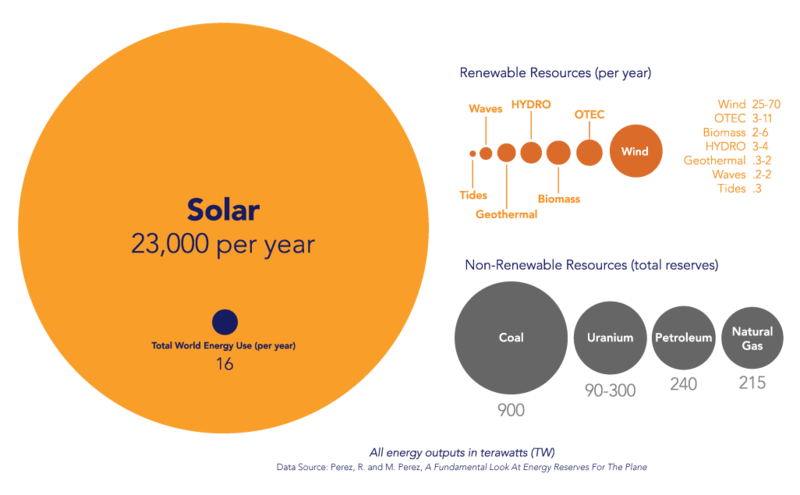 It’s important to understand that when we’re talking about solar energy as a resource, we are talking about annual potential, not monthly potential. Yes, in December, a solar panel in Austin, Texas will beat the pants out of one installed in Maine. But, our summers have longer days and our cooler climate allows the equipment to produce more power than it would the Southwest (more detail in the “Solar Works in Winter” chapter), making up for the lower energy production experienced in winter. When we started installing solar electric systems in the early 2000s, prices were well north of $9/watt installed. A typical home needs roughly 5,000 watts of installed solar electricity to meet all its needs, so that meant a typical system for the home was $45,000. By Spring 2017, that price had declined to roughly $3/watt in most places where ReVision Energy does business, meaning the same system would be only $15,000! Over that same period of time, grid electricity rates have gone up across the board, making solar significantly more affordable. Now that we’ve established that solar is abundant in New England (Despite what a bleak day in January would lead you to believe) in the next chapter, SOLAR CAN OFFSET FOSSIL FUEL USE, we can talk about the core concepts of electricity generation – how it’s measured, how you’re billed for it, and how adding solar electricity can change both your electricity bill and even how much fossil fuels you use in other parts of your home. Do you want to see what your solar potential is?